Dentistry is one of the greatest professions in the world. There is nothing like a warm smile with a beautiful set of teeth that says the person has been taking care of themselves. Periodontology allows me to practice a profession that has deep implications for medicine, as research has now shown that any type of gum infection can drastically affect general health. I want my patients to have a healthy mouth and a beautiful smile for the rest of their lives. I get to talk to many unique people every day, people in all walks of life. It allows me to rejoice with those who celebrate success and also to console those who experience tragedies. Quite often, when people come in they feel comfortable to talk, so my profession becomes one that takes care of the whole body and mind. It is a profession like no other. What you put in, you get back a thousand fold, not monetarily but in riches that are far beyond. I graduated with honors from Loyola University School of Dentistry and completed my specialty training in periodontics, dental implants, and intravenous sedation in 1982 at the University of Illinois Dental School, and my residency in anesthesia and medicine at Rush University Medical Center. My undergraduate degree was received from Northwestern University. Having completed a general practice residency and fellowship in general anesthesia at Rush, Presbyterian/St. Luke’s Medical Center, I am also able to offer my patients intravenous sedation. To me, continuing education is the life-blood of dentistry. It's a way to expand my knowledge base, keep things interesting and pertinent, and keep up with new developments. I attend roughly 20 to 30 days of continuing education per year in order to keep up my skill level in medicine, anesthesia, dentistry, and practice management. This enables me to treat my patients with the most current, proven, and successful techniques and therapies. 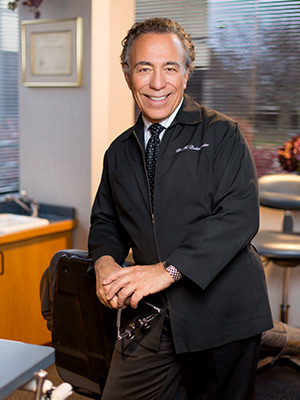 I have been in private practice since 1979 and at our present location in Hoffman Estates since 1981. This has given me the opportunity to establish an excellent rapport with the community and general dentists in the surrounding Chicago-land area. I also have a passion for teaching others. For more than 20 years, I have lectured on multiple topics, which include practice management and leadership, advanced periodontal procedures, and CT imaging and virtualization. Presently, I teach laser surgical procedures throughout the United States and the world. Very seldom in life do you find that people are just as interested, if not more interested, in your practice as you are. I am very dedicated, and I find that my team is the same way. They definitely go the extra mile for whatever I need. This is such an encouragement to make me want to do the best and give them the best. Our office is made up of a variety of personalities with a variety of passions. It makes our team very interesting, and gives us different perspectives on everything we do. I am a Chicago native, born and raised, and currently live in the northwest suburbs. I love electronics, computerized modules and computers, and programming. I have had a passion for photography since I was 14 years old. In my free time, I love to travel and to play golf.